Last night I published a post reporting that Keith Schembri, the Prime Minister’s scandal-ridden chief of staff, rang Saviour Balzan of Malta Today at around 1am the night I broke the Egrant Inc/Michelle Muscat story (last Thursday). I also reported that the following Saturday, Balzan rang Schembri twice, one in the morning, when they spoke so briefly it could only have been a short sentence, and against in the afternoon, when they spoke for around 20 minutes. The Saturday phone calls need not have been an issue, because it is completely normal for journalists to ring the Prime Minister’s chief of staff in the course of their work. But the fact that Schembri rang Balzan in the early hours of the morning, the night the Egrant Inc/Muscat story broke is clear evidence of another kind of relationship altogether. And that is what makes it news. It is a significant indicator that Balzan is yet another cog in this particular wheel. Balzan’s initial reaction was to hit his Facebook page, which is dominated by an anonymous Labour troll using the false name Christian Thorn, who posts highly offensive insults and pro-Labour/anti-PN propaganda as though it is his own Timeline, to call me a liar and say that he is going to file a libel suit against me immediately. This is exactly what I mean when I say that the system has got to be reformed because people like Saviour Balzan, Keith Schembri, Konrad Mizzi, Chris Cardona and Joseph Muscat use the libel courts to file vexatious suits for public-relations reasons in the moment, even when they know that the facts are correct. Balzan knew he had no way of winning any such suit, not only because it isn’t libellous to say that a journalist spoke to the Prime Minister’s chief of staff on the telephone, but also because telephony companies can be subpoenaed to provide call logs as evidence in court. But all he was interested in was the immediate PR stunt of saying that he is suing me, and that I am a liar – exactly the same tactic used by his close friend Keith Schembri, by Konrad Mizzi and Joseph Muscat. My reaction to this was to publish precise details of the call times and duration, plus their phone numbers. As Balzan knows, I didn’t need to get their phone numbers from anybody, because I in my line of work I had them already. 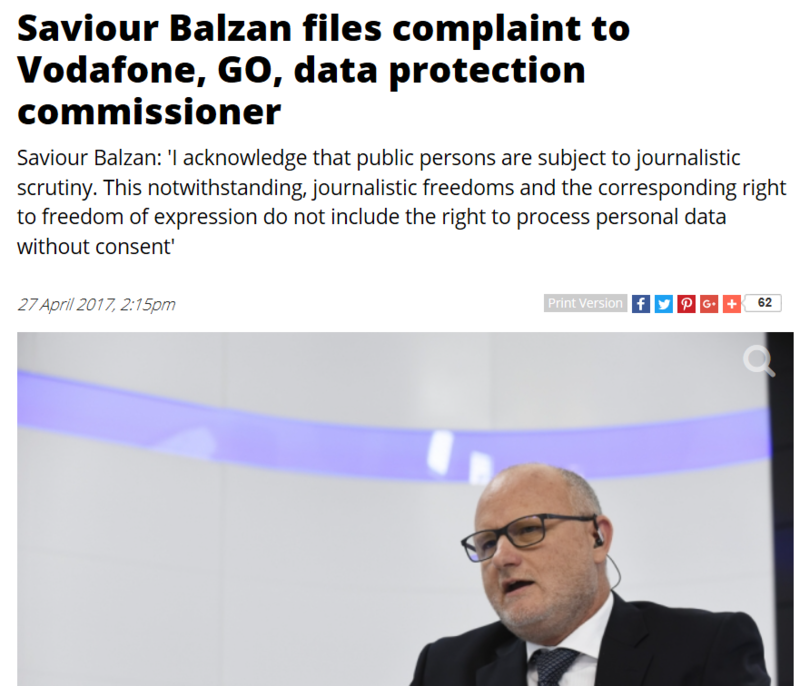 So much for the threats of suing: Balzan immediately took down that post from his Facebook Timeline, and instead had his men at his newspaper write up a big story about how he is going to file a complaint with the Data Protection Office and with mobile telephony operators, Go and Vodafone. In the space of an hour or so, he went from calling me a liar who’s going to be hit by a libel suit, to complaining about how his privacy had been invaded and how his private data had become public. After calling me a liar, he found himself publicising the fact that he is the one who lied. And all this because he doesn’t want anybody to know the exact nature of his relationship with Keith Schembri, and that it’s the kind of relationship in which Schembri feels comfortable ringing him at 1am on a bad night for the government. Instinct tells me that the reactions Balzan is most worried about are those of his staff, who probably don’t know that their boss is so cosy with the scandal-strewn inner circle who have hijacked the country – cosy enough for 1am phone-calls. As any good journalists would be, those staff are clearly champing at the bit to let rip on the Schembri/Hillman/Tonna/Mizzi/Muscat scandals, but Schembri, Hillman and Tonna in particular seem to be no-go zones. His first Facebook post saying that I am a liar and that he is going to sue me was replaced later in the day by this complaint that the political parties and the Institute of Maltese Journalists have not issued statements in his support, as the “victim” of another journalist who revealed that he talks to Keith Schembri after midnight.